Pitchers and catchers report to Spring Training in less than four weeks and the New York Yankees are the new favorite to win the 2019 World Series. According to a recent update from the South Point Casino and Sports Book in Las Vegas, the Yankees are 11-2 odds to win the World Series. The Yankees were previously lumped together with the Boston Red Sox, Houston Astros, and LA Dodgers at 6-1 odds to win the title. The Yankees orchestrated several offseason moves, which put them ahead of the pack, including the defending champion Red Sox. Yankees general manager Brian Cashman traded their top pitching prospect, Justus Sheffield, to the Seattle Mariners for lefty starter James Paxton. The Yankees shored up their already unhittable bullpen by re-signing Zach Britton and signing Colorado Rockies reliever Adam Ottavino. The Red Sox defeated the Dodgers in five games to win the 2018 World Series. Now it’s time to fade the Red Sox because it’s a near-impossible feat to repeat in the modern era. Not a single champion have won back-to-back World Series titles since 2000.The Yankees were the last team to do it at the turn of the century with a three-peat from 1998 to 2000. The Dodgers appeared in the finals for a second season in a row, but failed to win both times. They lost to the Houston Astros in the 2017 World Series. Their goal is to return to the World Series for a third straight trip and to finally win it. The Dodgers recently extended the contract of manager Dave Roberts through 2022 and extended Clayton Kershaw’s contact. The Yankees added a second Ace to their rotation by acquiring James Paxton in a trade with Seattle. The fire-throwing lefty tossed a no hitter last season for the Mariners. The Yankees let David Robertson walk in free agency when he signed with the Phillies. To replace their former set-up man, they signed sinker-ball pitcher Zach Britton and Adam Ottavino, who struck out 112 batters in 77.2 innings last season for the Rockies. The top bullpen in baseball is anchored by closer Aroldis Chapman, set-up man Dellin Bettances, and middle relievers Chad Green, Britton, and Ottavino. Everyone knows the Yankees can hit home runs. 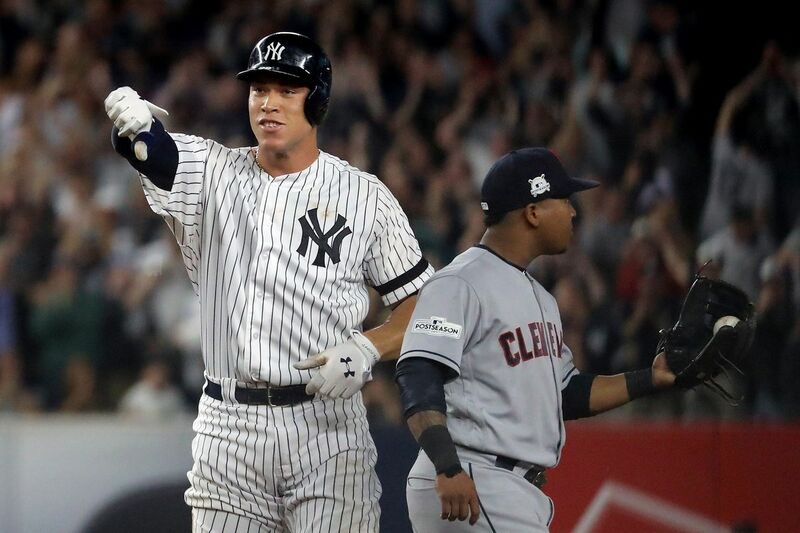 The Bronx Bombers set the MLB record for most dingers in a season thanks to contributions from sluggers Aaron Judge, Giancarlo Stanton and Gary Sanchez. Young infielders Miguel Andujar and Gleyber Torres demonstrated the Baby Bombers could also hit for power. The two were finalists were AL Rookie of the Year, but lost out to Shohei Ohtani from the LA Angels. Shortstop Manny Machado and outfielder Bryce Harper have yet to be signed by a new team. The top two free agents are caught in a lengthy negotiation process with prospective suitors. The Philadelphia Phillies are 15-1 odds to win the World Series and will see a spike if/when they sign Harper. Supposedly before the season ended, the Washington Nationals offered Harper a ten-year deal worth $300 million, which he rejected. The Phillies have the inside track. Meanwhile, the Chicago White Sox are negotiating with Machado. The initial numbers indicated eight years for $200 million, but the latest offer was somewhere in the ballpark of seven years for $175 million. Machado allegedly sought a $300 million contract spread out over 10 years.